Shogi – Play Japanese chess online, Shogi rules, printable shogi boards and pieces, and all kinds of Japanese chess resources. Play Japanese chess online, Shogi rules, printable shogi boards and pieces, and all kinds of Japanese chess resources. Shogi (将棋) is the Japanese version of an ancient Indian game that became Chess in Europe and xiangqi in China. In fact, Shogi is frequently referred to as Japanese chess in the English speaking world. Shogi is played on a 9×9 board, unlike the 8×8 board of Western chess. Shogi has some pieces that are very similar to Western chess, a king, pawns, rook, bishop, and knight. Shogi also has pieces that are not found in Western chess such as gold generals, silver generals and the lance. The most interesting difference between shogi and chess is that when opposing pieces are captured in shogi, they become loyal to the player that captured them. 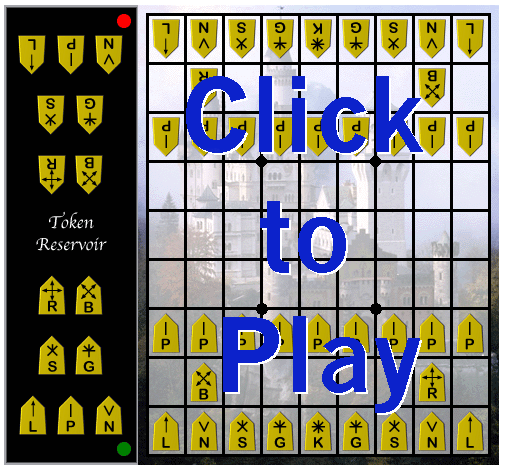 These captured pieces are then dropped back on the board to continue the game. You can get a feel for the game of shogi by trying my free online shogi app (still very much beta). The online shogi app should work in any modern web browser on PC’s, Macs, tablets, and smart phones. Fun Historic Games I’m putting together a site of historic board games you can play in your browser. The goal is to publish games you don’t see too often, but have been around 100+ years. I’m almost done with a beta version of Tori Shogi, also called Bird Chess and Bird Shogi. Tori Shogi is a game from Japan that is around 200 years old. Be sure to follow the progress on the new historic games site. I still have my beta version of my shogi app up on this site. The beta version of my shogi app runs on most browsers. I am currently working on an update. You guessed it, the update will be on my historic games site when I’m finished. However, I may mirror it here, too. Chess variants all come from an Indian game called Chaturanga created around 600 AD. As the game migrated east and west it changed. Western Chess and Japanese Chess (Shogi) are cousins of the original game from India. Japanese Chess (Shogi) was played in Japan in the modern form about 500 years ago. Japanese Chess differs from other chess variants because of the drop rule. Pieces captured become yours, and you can choose to drop them back on the board to attack their former army! I have recently shuffled addresses of some Shogi resources. So if you’re looking for the printable shogi boards, English shogi notation, Japanese shogi notation or any of the older Japanese Chess articles that used to be on this site, but aren’t here now, be sure to take a look at Gene Davis Software’s shogi posts. Every shogi-related article that was removed from this domain should be over there. NEWS … My english tsume puzzle book is for sale on Amazon and other retailers. Solving tsume puzzles has long been recognized as the fun way to improve end game performance in shogi (and chess.) This is the first English tsume puzzle book. Now it’s time for me to get back to work on that beta of Tori Shogi! You caught me in the middle of giving my shogi site a long needed server upgrade. I should already have the link for playing shogi back up and running. Also the kifu link and the tsume links should both be close to working. You might see something about Gene Davis Software on them, but they probably work. For now, hop over to my current mirror at Gene Davis Software to get access to all the stuff normally found here. I’ll have this mess cleaned up shortly!